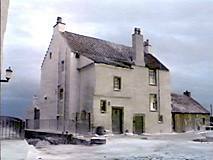 The town scenes in The Winter Guest were filmed in Pittenweem. From the main road through Pittenweem follow the signs to the Harbour where there is free parking alongside the harbour front. 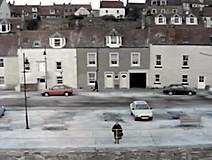 The town scenes were filmed at various locations along this road between the two arrows on the map. Pittenweem is a working fishing harbour whose fish is sold, amongst other places, at the Anstruther Fish and Chip Bar on the harbour front in Anstruther a few miles further along the coast. This shop is reputed to do the best fish and chips in Scotland. Definitely excellent but vegetarians should note that they use animal fat for frying. The pictures below were taken in February and go to show that conditions in Pittenweem aren't always as bleak as in The Winter Guest.